As a premier source for motorsports art, Kevin Paige Art cultivates relationships and seeks partnerships that ultimately fulfill your creative needs as an individual or as an organization. 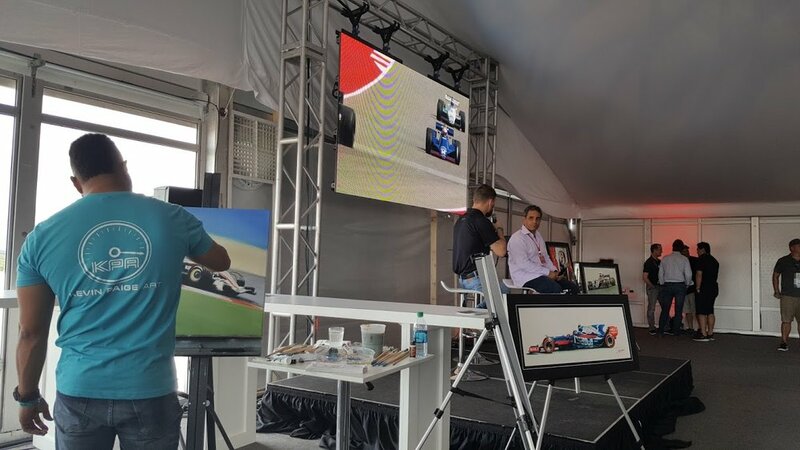 Live painting event - Kevin at the 2017 US GP with Juan Pablo Montoya speaking live. Empower your brand within your organization or with your audience by associating with the themes and motifs found in motorsports (as an artform – can delete) – victory, technical achievement, pinnacle of competition, teamwork, growth, triumph and beauty. From commissioning artwork for an exclusive, corporate gift, to a live painting event featuring, Kevin Paige Art will work with your organization to create a custom package tailor-made to your needs. Beautiful, luxury item that can be tied directly to your brand. Perfect as a decorative statement, token of appreciation, or commemoration of achievement. How can Kevin Paige Art help you? Whether you're looking for a custom commission or want a unique attraction for your next hospitality event, Kevin Paige Art wants to help tailor a partnership to your creative needs. Please let us know the best way to get in touch with you! Best time and number to reach you.